Speed Clean Your Oven with Cadie's Oven Cleaning Wipes. Your spring cleaning routine should include a thorough cleansing and de-greasing of your oven. What was once a gunky, time-consuming process has been made clean and effortless with these simple to use disposable wipes. Their orange scent is less harsh than traditional oven cleaning products, and their oil-based formula is just as effective as commercial options for cutting through grease. Fight Tile Grime with the Grout Gator. If you're still having nightmares about the last time you scrubbed your bathroom tile grout on your hands and knees using an old toothbrush, you can rest assured that those days are behind you. The Grout Gator's stiff brush bristles snap on in a perpendicular direction and can be adjusted to fit the width of your tile. With its four brush head attachment options, there is no tiled surface too big or small for the Grout Gator, which means you can stop stockpiling old toothbrushes. Clean Your Microwave in three, two, one... Forget scrubbing deep-set stains, splashes, and splotches inside your microwave by hand. Instead, use a natural vinegar solution to clean your microwave more thoroughly in half the time. Fill a microwaveable bowl with one to two cups of water and one to two tablespoons of vinegar. Add just a drop of Young Living lemon essential oil to masque the smell of the vinegar. Put the bowl in the microwave and heat for five minutes. Leave the door shut for two additional minutes to allow the steam to further penetrate deep grease and grime. Carefully remove the hot water bowl, and easily wipe the inside of the microwave with a cloth or sponge. Watch the dirt and food slide right off, and sigh contentedly. Fight Shower Scum with a Credit Card. If your glass shower door is suffering from caked on soap scum, put away the toxic shower cleaners and whip out your plastic instead. An old plastic card can be used to scrape soap scum off of a glass shower door. Just be sure to use an old card that no longer holds a balance or is tied to your bank account. Use Baking Soda to Clean Laminate Bathroom Counters. When everything else fails, baking soda can solve even your must stubborn bathroom counter stains, and it's non-toxic. Sprinkle some baking soda directly onto the stain and use a wet microfiber cloth to gently scrub it away. Invest in a Vacuum Designed for Pet Hair. If you have pets in your home, you are already fighting the battle against their hair and fur. The Black & Decker Cyclonic Pet Vac is specially designed to loosen pet hair from upholstery and carpet fibers. It even includes an electrostatic "Retriever" turbo brush to further reduce time spent vacuuming-up after your furry loved one. Quickly and Safely Clean Outdoor Windows. Don't even bother getting your ladder out of the garage. This spring, clean your outside windows using the Windex Outdoor All-in-One Glass Cleaning Tool. Spray the outside of your windows with water and wipe away stains using the pad attached to the end of the 11-foot handle. Clean Your Garbage Disposal with Ice. Toss a handful of ice cubes into your garbage disposal and let it run. The hard ice cubes will help to break-up grease and food particles. Toss some lemon zest in with the ice to help eliminate food odors. Use Salt and Vinegar to Polish Copper. Salt is a natural solution for polishing tarnished copper. Make a simple solution using 16 ounces of white vinegar and three tablespoons of salt. Spray the solution onto the copper, let it sit briefly, and gently wipe clean. Fizz Away Toilet Bowl Grime. Freshen your toilet bowl with effervescent tablets in between routine scrubbing sessions. Drop two tablets into the bowl and let them soak for at least 20 minutes, brush and flush. A clean house is a happy house. This spring, use the time you saved with these quick cleaning solutions to make sure you have financially protected your home with the best homeowners insurance policy available. Southern Oak Insurance can help you safeguard all of your most valuable belongings. Our agents are experts in Florida homeowners insurance and understand the marketplace dynamics that can impact premium costs. They will help you find the most cost efficient policy to protect all the things you value in your home. 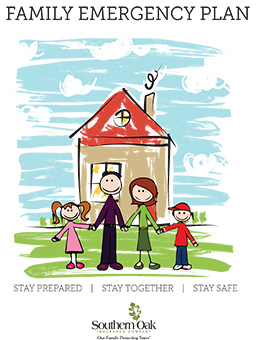 Download our Spring Cleaning and Home Safety eBook to learn more about how you can keep your house clean and family safe this season.